Find and Develop Your Organizational Happiness Sweet Spot. A Real and Unique Competitive Advantage. of other people and a burning desire to do something about it. 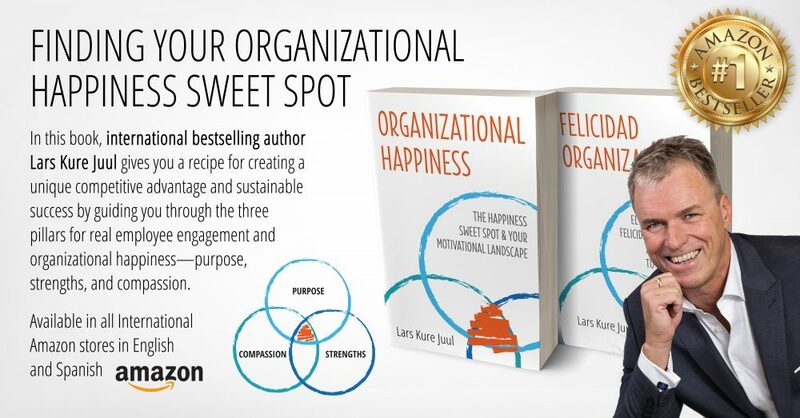 Organizational Happiness: The Happiness Sweet Spot and Your Motivational Landscape by Lars Kure Juul is now available on Amazon in print and e-book. This book gives you a recipe for creating a unique competitive advantage and sustainable success by guiding you through the three pillars for organizational happiness—purpose, strengths, and compassion—and finding your Organizational Happiness Sweet Spot. What Is The Happiness Sweet Spot? The Happiness Sweet Spot is a framework a toolbox and a book that helps you find and develop a real, unique Competitive Advantage by focusing your efforts and strategies on Purpose, Compassion and Strengths.